Arcadian 6, no. 11 (Apr. 20, 1984): 102-103. This is a game of chance, strategy, and greed for 2-4 players. There are different colors for each player. The object is to be the first player to reach 5,000 points. You start by rolling six dice. If you don't get a pointer (a one, a five, or three of a kind) on the first or subsequent roll(s) you must pass the play to the next player without adding your present score to your total. 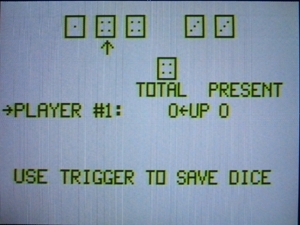 You must save, at least one pointer on each roll of the dice. If you get pointers on all six dice, you have the option to roll again (greed) but remember any time you roll again and don't get a pointer you must pass play without adding to your total. Three of a kind need not be side by side, but must be on a single roll of the dice. Crazy Dice Rules (pdf) - Scanned rules from the Arcadian in pdf format. This is the preferred version because the instructions have images that come across much better when not in plain-text format. Crazy Dice Rules (Text) - OCRed rules from the Arcadian in text format. ARCADIAN 6, no. 4 (Feb. 23, 1984): 38. Note: $100 Prize Winner (February 1984). This is a two player game. The object is to draw lines between two dots. Try to complete a box to capture it. Completing a box gives you another turn. Try to keep your opponent from being able to complete a box. To create a line, move the flashing dot to where you want to start your line and pull the trigger. Then move the flashing dot to a dot above, below, to the right or left (no more than one done away and not in a diagonal direction) and pull the trigger. Dot-to-Dot - Original Arcadian program submission letter, including hand-written BASIC program listings. ARCADIAN 6, no. 9 (July 26, 1984): 85. Dig for oil and try to gain one millions dollars. This game was inspired by Esoterica's game "Wildcatter." Horse Race Math Horse Race Math. HORSE RACE MATH is a rework of Howard Brecheisen's HORSE RACE program from ARCADIAN 3, no. 1 (Nov. 06, 1980): 6-7. It's a 1 to 4 player game. 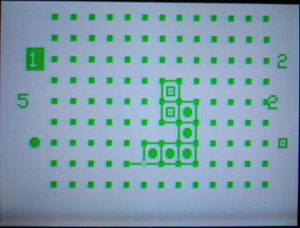 Use the Knob to get near the answer and then use the joystick (which disables the Knob until another program is displayed) to zero-in on the answer. Pull the trigger when you have the right answer. You can't hold the trigger and attempt to run over the right answer. Note the arrays in the type-in program, which must be loaded without a line number. Horse Race Math - Original Arcadian program submission letter, including hand-written BASIC program listings of of two versions of Dot-to-Dot, but not of Horse Race Math. ARCADIAN 5, no. 5 (March 4, 1983): 79. This is an educational program to develop skills in determining the Greatest Common Factor and the Least Common Multiple, at grade levels 7 - 9. Change values in lines 21 - 34 to get a new series of questions. Paul Thacker says, "[Pos. & Neg. Numbers" is a] math quiz focusing on positive and negative numbers." Part of "Bob Fabris Collection." Unpublished "Arcadian" submission. Paul Thacker, "[thinks] that PTO stands for parent teacher organization. I believe [the program] had some Christmas-themed music and animations." Trap Shooting is a type of clay pigeon shooting. Paul Thacker says, "It's a very simple game. You just fire at clay targets from a gun at the bottom of the screen." No instructions were included in the "Arcadian" for this game, Paul Thacker makes a comment about the game here. Published in ARCADIAN 5, no. 11 (April 4, 1983): 93.